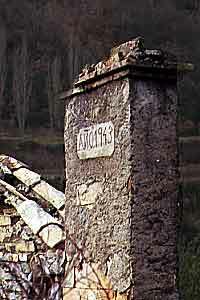 Yésero is on the road from Biescas towards Torla and the famous Ordesa National Park. Pass the Tunél de Gavín and park the car in the Barranco del Infierno before reaching the branch for Yésero. The mill is on the left bank, down in the river bed. 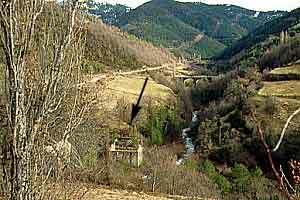 The mill of Yésero with the Río Sía and the Puerto de Cotefablo in the background. 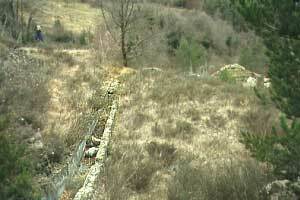 The bridge leads to the village of Yésero situated behind the pastures at the right. The Barranco del Diablo comes from the left. 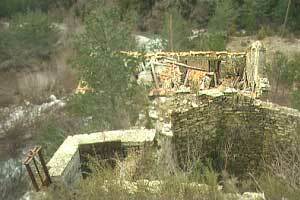 The outer walls are still fine, but the roof collapsed and in 1998 was resting on the upper floor. The latter later collapsed under the weight thus burrying the workplace of the mill. 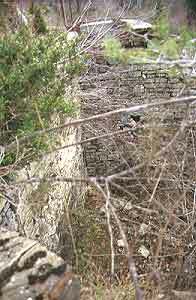 The water reservoir lies next to the mill and a bit higher. 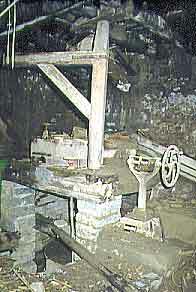 The base of it is level with the upper floor of the mill. It measures 4 m across and with a depth of 6 m is embalse and cubo in one. 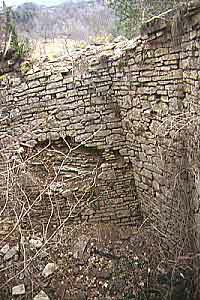 The thick walls consist of mud, boulders and bricks. The water came pouring down for more than 5 m before moving the rueda. The balsa is fed by two supply channels. 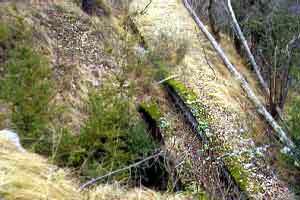 The first, small and shallow, comes from the Barranco del Infierno and is buried under the basement of the road brought up to modern standards. The other canal is much bigger and longs the Río Sía. We could not find the point where it splits off from the river. Both channels enter the embalse at the same point fitted with closing valve and grid. The reservoir is drained by two outlets, one for each turbine. 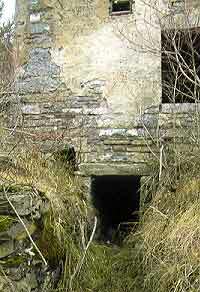 The tube leading to the power station is visible in a corner at the outside near the entrance door of the mill. The workplace before the roof collapsed was neglected and full of dirt but still worth a visit because of the machinery. 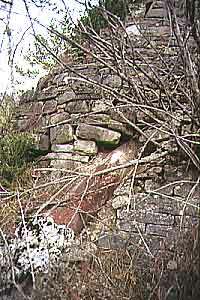 The mill stones were situated at the wall directed towards the balsa (right side of the picture). 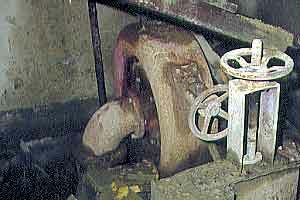 The wheel in the middle is the regulator of the turbine. The cupboard in the background is a bolting machine. 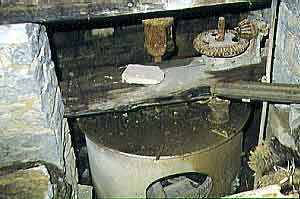 A corn sifting machine is situated closer to the door and was in 2003 the only instrument not mashed by the roof, although the drum was corroded to bits. 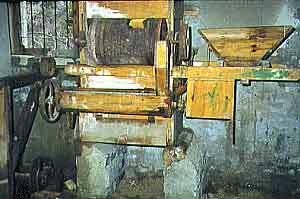 Find other examples of both machines in the San Marco mill of Castillazuelo. 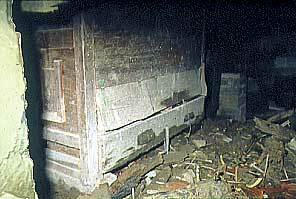 The power station was isolated from the rest of the room by a thin inner wall. A the time of our visit the small space only contained a turbine. All the usual contraptions of an electricity station where removed; only bolts and some isolators where left behind. 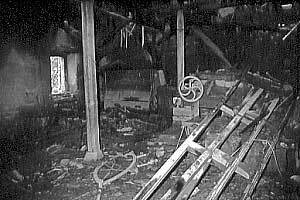 Both turbines had their own outlet. 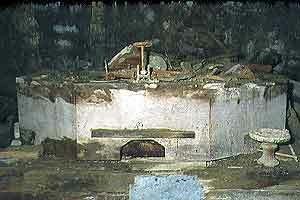 The cárcavo of the power station opens directly into the Río Sía while the water used in the mill was drained through a spacious tunnel below the floor towards an outlet in the facing wall. A channel then leads towards the Barranco del Infierno.